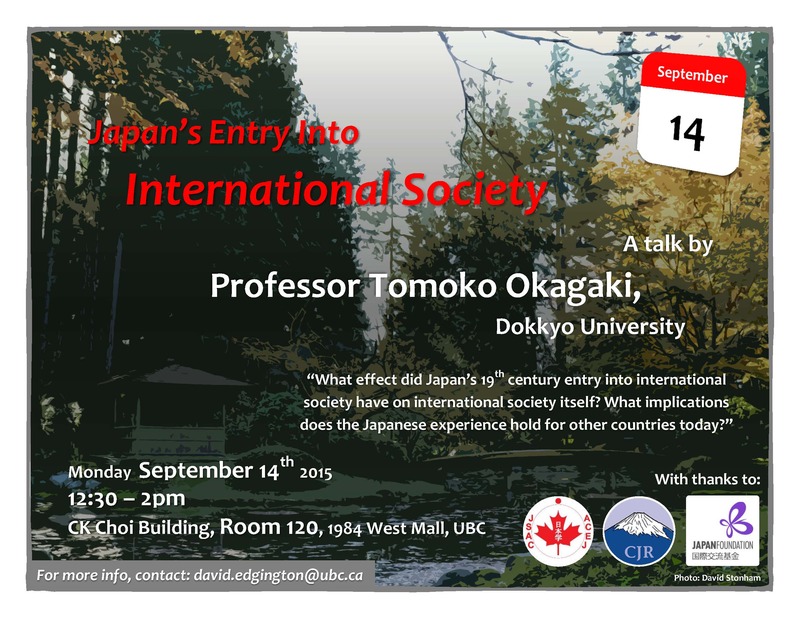 A talk by professor Tomoko Okagaki, Dokkyo University, Tokyo. Abstract: Japan’s 19th-century entry into international society was sudden, dramatic, and fraught with danger, both domestic and international. Between 1853 and 1899 Japan reinvented itself as a modern sovereign state, shedding its historical isolation and long-standing patterns and practices of politics and governance. A crucial task Japanese leaders faced was figuring out how to conform to existing norms of international society, which were largely European in origin. How did they balance international and domestic constraints and resources? What effect did Japan’s entry into international society have on international society itself? What implications does the Japanese experience hold for other countries today who are in the process of either attempting to conform, or actively resisting fully conforming, to prevailing international norms? Bio: Tomoko Okagaki is Professor of Political Science at Dokkyo University in Japan. She holds a doctoral degree in political science from the University of Michigan and was a visiting student at the University of Toronto (Sankei Scholarship) in 1986-1987. She also studied at the University of British Columbia as a recipient of a Government of Canada Award 1988-89, obtaining her master’s degree there. Her long-standing research interests in international politics include, inter alia, state socialisation, Asian regionalism, and political thoughts of international relations. In 2013 she had her monograph, The Logic of Conformity: Japan’s Entry in International Society, published by the University of Toronto Press. Her other recent publications include the co-translation of Kenneth Waltz’s Man, the State, and War (Keiso Shobo, 2013) and Theory of International Politics (Keiso Shobo, 2011). She held an Abe Fellowship from 2008-2010, spending a total of two years as an academic associate at the Weatherhead Center for International Affairs and as a visiting scholar at the Reischauer Institute of Japanese Studies, both at Harvard University. She recently returned from her teaching engagement with le Départment de Géographie, Université Paris 1 Panthéon-Sorbonne as a professeure invitée and with L’institut national des langues et civilisations orientales, where she taught comparative regionalism.